Last week I worked at an event at university called STEMpunk. The event was aimed at young people from schools and colleges and was designed to bolster their interest in STEM subjects (science, technology, engineering and maths). 'STEMpunk' is of course a play on steampunk - one of my favourite genres. I worked on an exhibit called 'Weird Creatures', featuring mainly invertebrate species and including some wonderful live specimens. The photo above shows just a small part of the exhibit, but I didn't want to bore you all with a ton of photos of how it was set up. Here is a closer look at a few of the things that are in the tanks, as modelled by yours truly. Just a quick warning in case anyone is a bit squeamish, the photos are of a variety of invertebrates but there are no spiders. You can just about see another peek at the millipede in my hands in this photo I pinched off the University Twitter page. Here is a photo of me with Skelly... and some slightly more sensible pics too. I must say I really enjoyed wearing the spiders in my hair - I must get them out more often. 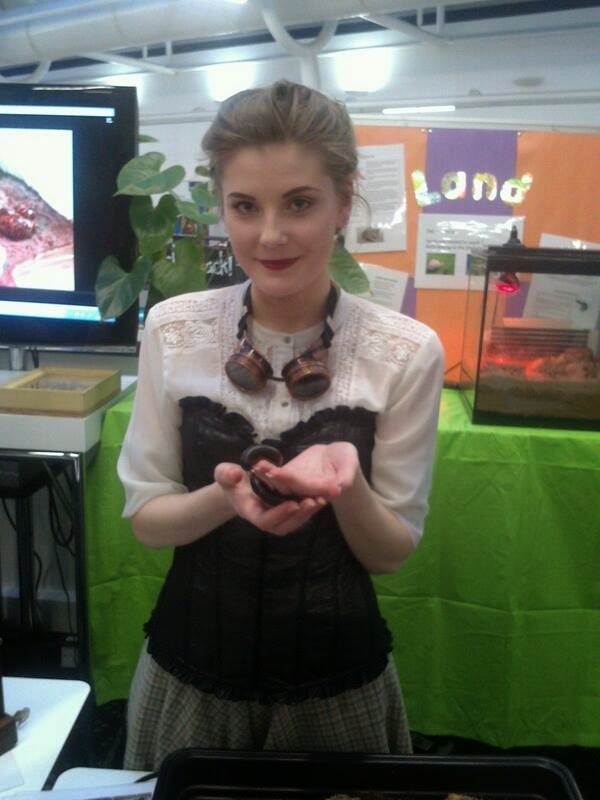 I had a really fun time helping out (read: playing with the millipedes) and it was fun to dress in this style. I'll be keeping my eye out for some older (or older looking) things than I usually choose when I go shopping. I have a few ideas for some more outfits of this ilk. PS, if anyone is in the area this Sunday 30th, there is a pop-up vintage fair at The Ridings in Wakefield. It doesn't look like I will make it there myself but it looks like there are a lot of fun things happening. Let me know if you decide to pop along! What a cool event to get to be a part of! That's actually a really cool event! Wish us humanities and social scientists could something like that. :/ Would love to get people more engaged in politics. It feels a bit like velcro. Their legs are quite strong so it's not really tickly, and although I don't personally find it scary, it was a bit offputting the first time I tried holding them.